Thallus: caespitose, usually 3-5 (-12) cm long branching: regularly isotomic dichotomous, axils usually broad towards base and acute towards tips branches: even in thickness, 0.3-0.4 (-0.5) mm diam., sometimes slightly compressed towards base but not twisted or foveolate, somewhat brittle; base persistent; short perpendicular lateral spinulose branches sometimes present, occasionally abundant surface: very pale brown to cervine brown or rarely dark brown to black, often darker towards base, smooth, usually shiny; pseudocyphellae: absent soralia: usually abundant, fissural, sometimes slightly raised, usually narrower than the branches on which they occur, white (or speckled blackish with incipient spinules), 0.3-1.0 mm long, bearing tufts of blackening isidioid spinules 0.5-2.5 mm long Apothecia: very rare lateral, 0.8-2.0 (4.0) mm diam. ; thalline exciple: concolorous with thallus, thick, usually becoming sorediate; disc: concave at first but becoming convex and sloughing the margin with age, light brown to reddish brown asci: clavate, 8-spored ascospores: subglobose, 6-7 x 3-4 µm Spot tests: outer cortex K-, C-, KC-, P-, UV-; inner cortex and medulla K-, C-, KC-, P+ red; soralia P+ red Secondary metabolites: fumarprotocetraric and protocetraric acids. Substrate and ecology: mainly on conifers in sheltered to somewhat exposed sites but also found on rock outcrops or boulders, lignum, and rarely on soil World distribution: circumpolar and circumboreal in the Northern Hemisphere, extending south to Mexico and Central America Sonoran distribution: on Pinus and Pseudotsuga in Arizona and Chihuahua at 1700-2900 m. Notes: Although it is somewhat variable, B. furcellata is usually easily identified by the groups of isidia-like spinules on the soralia. 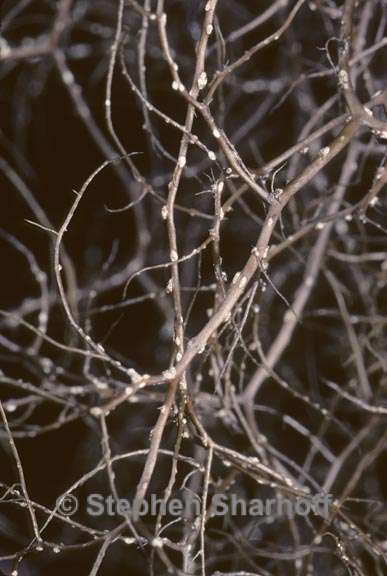 According to Brodo and Hawksworth (1977) B. fuscescens and B. chalybeiformis also occasionally have such spinules; however, B. fuscescens is usually pendent, with partly anisotomic branching, partly unevenly thickened branches, much paler towards the base and more often dull, and the soralia are often broader than the branch bearing them and partly tuberculate, while B. chalybeiformis has coarser branches with obtuse axils, a darker and more olive-blackish color, and sparse, tuberculate soralia, and usually grows on rock. Neither of them normally has a P+ red medulla.